Although it is one of the larger guilds in the Exercise and takes a leading part both in peal ringing and other activities, the Winchester and Portsmouth Diocesan Guild has not before had a bell restoration fund in existence. At their A.G.M. at Petersfield on July 1, however, this omission was rectified and members attending - numbering over 120 - approved the setting up of the fund, agreed the proposed rules, which had been circulated, and voted the sum of £83, which was held from the now defunct Southampton District, to the fund, giving it a good financial start. Ringing was at many churches during the morning, and the excellent arrangements for the meeting had been carried out by Mr. Charles Bassett (Petersfield district secretary), assisted by a committee. At 2.10 p.m. the guild master (Mr. R. R. Savory) opened the business meeting, held in the Church Hall, and he welcomed members and visitors alike. Messages of greeting and good wishes were read from the Bishops of Winchester and Portsmouth and a number of apologies were given from members unable to attend. A period of silence was observed for the Rev. P. Kennedy (Heckfield), Messrs. A. Matthews (Portsea), E. Wilton (Lockerley) and Mesdames R. May (Liss) and J. Williams (Christchurch), who had died during the past year. The guild treasurer (Mr. K. S. B. Croft) presented the accounts, which showed an increased balance of nearly £118 which, considered as satisfactory, was approved by the meeting. Mr. Croft said that he had transferred deposited funds to another building society which paid a much better rate of interest. This action was also approved and thanks were extended to the treasurer for his work. A 4-page foolscap document giving complete details of peals rung during the year was circulated by Mr. D. T. Matkin (peals recorder) and this proved that the guild’s activities in this direction had been outstanding. It was again another record year - 181 being scored on tower bells and 27 on handbells - altogether 58 more than in 1970. Details of towers and personal records were all analysed, giving a very lucid picture of all that had taken place. Mr. Matkin received well-deserved applause for his work as peals recorder. Mr. A. 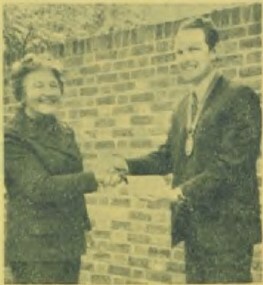 A. J. Buswell also was thanked (in his absence) for preparing a list of the guild’s quarter peals rung in 1971. The librarian (Mr. M. J. Butler) gave details of the books which had been acquired during the year and it was agreed that bound copies of The Ringing World for past and future years be obtained for the guild library. A junior member of the four Central Council representatives, Mr. Geoffrey Dodd, read a paper he had prepared of the Central Council’s 1972 meeting in London and, with his well-known volubility and classic humour, presented an excellent picture of his own impression of this his first Council meeting. There was considerable discussion on the Basingstoke 9-bell peals and the C.C.’s decision to accept future peals rung on these bells but not to recognise three other peals which had in previous years been rung there. It was finally agreed, by 60 votes to 2, to press for acceptance of these three peals, and the guild is to send a resolution to the C.C. secretary for inclusion in next year’s agenda. Mr. D. C. Jackson gave a comprehensive review of the past year’s activities when presenting the hon. secretary’s report and concluded by reiterating what he had said at the dinner earlier in the year, challenging the guild to ensure that by centenary year (1979) all towers in the guild would have a band capable of ringing rounds and call-changes. The Bell Restoration Fund, referred to previously, was discussed at length, following a report of a sub-committee and given by Mr. K. Croft. Various ways of raising funds were suggested and during tea another £6-plus were collected towards this object. It was stated that the fund would be registered as a charity and that the Winchester Diocesan Board of Finance was probably the best place for investment of such funds. Following the unanimous vote of acceptance, two trustees were elected to the administrative committee, viz., Messrs. F. E. Collins and R. Green. Copies of the Triennial Report (1969-71) were available and the general secretary was complimented on having the report ready for the meeting. Various estimates were read out for the printing of an annual report and explanations of future productions were accepted by the meeting. A report editor was required to deal with yearly publications, and it was agreed, Mr. Richard Green being voted to that office. The addition of the hon. auditor and the report editor to the guild committee was approved and amendments made to the appropriate rules to allow for these officers to attend. The sum of £10 was voted to help pay for work completed at Burghclere, Mr. F. E. Collins saying that the charge made for the work by Mr. Arthur Fidler was very reasonable. Mrs. Ann Guy, who has recently retired as hon. secretary of the Isle of Wight District after 31 years, was elected an honorary life member. Messrs. E. Hedger (Alton) and V. Shadbolt (Blackmoor) also are life members, having been guild members for 50 years, and on the proposition of the master it was agreed to offer life membership to the retiring Bishop of Southampton. Congratulations on the success of the annual dinner were expressed, it being stated that next year’s function would be on April 28 at Southampton. Mr. A. V. Davis suggested that a bellringing course be organised - either for a day or perhaps a week-end - and he outlined the advantages to the Exercise in general and the guild in particular. Messrs. E. Colley, A. V. Davis and K. S. B. Croft were appointed as a sub-committee to investigate the possibility of such a venture. During a general discussion a suggestion that honorariums be made to the master, secretary and treasurer was politely declined by the officers concerned, it being said it was not necessary. Sincere thanks were, however, extended to these officers for their hard work for the guild. Mr. E. Colley expressed concern about redundant churches and the loss of rings (and single bells) and Mr. F. E. Collins stated that the appropriate committee of the Central Council had the matter in hand. However, Mr. Colley was not satisfied with the expediency of that body. It was resolved that it be left to the committee, although details of any urgent cases could be published in the R.W. to ensure publicity and the diocesan authorities approached as to the possibility of obtaining the bells for resale or storage. Thanks to all who had assisted in the arrangements were expressed by the master and £1 was donated to the funds of each of the Sussex towers where ringing had taken place during the day. There were 28 items on the agenda of the guild’s A.G.M. and a service in Petersfield Parish Church was scheduled for 4.30. At 4.15 there were nine items still to be dealt with and these were cleared by 4.40. Nobody appeared concerned, however, and the vicar (Canon R. H. Granger) certainly was not put out. He gave a very warm welcome to all present and a bright and happy service was enjoyed. As soon as the hall was cleared after the last item of business a small army of helpers set up tables, rearranged chairs and laid out a substantial and varied tea - all home made. The vicar and about 120 ringers and friends enjoyed the meal, and thanks were given to Mr. C. Bassett and the tea hostesses. A delightful ceremony took place during the meeting when the master (Mr. Roger Savory) spoke of the valuable services as secretary rendered to the guild by Mrs. Ann Guy for 31 years in the Isle of Wight District. On behalf of all he presented Mrs. Guy with an inscribed silver cigarette box, and that lady, obviously taken by surprise but greatly pleased, expressed her thanks.